As a beauty junkie, nothing thrills me like discovering products that make me look and feel like a million bucks. But the fun usually stops when I look at the ingredients and realise that I don’t know what I’m lathering on. Cyclomethicone? Benzyl alcohol? Are these chemical-sounding terms *gulps* safe? More often than not, most of us use products without knowing what they are. To put your minds at ease, we deciphered some common ingredients so you can shop with confidence. You know television shampoo commercials where a lady happily rubs frothy bubbles in her hair like she struck toto? These foaming shampoos usually contain sulfates. Sulfates are commonly used as cleansing agents as they produce lather to trap oil-based dirt so they can be washed away effectively. They can be naturally derived or synthetic. For example, Sodium Lauryl Sulfate (SLS) is made of lauric acid, which can be from palm kernel oil, coconut oil, or petroleum. Though sulfates aren’t harmful, it has a bad rep for stripping the skin of healthy, natural oils. Hence, sulfate-free formulas may be a milder option as they don’t irritate the skin through excessive removal of natural oils. These days, parabens are like the bogeyman of the cosmetic industry. With many brands shunning it because of its media-fueled reputation as a toxic chemical. Despite what many cosmetic brands lead you to believe, parabens are not toxic. In fact, these anti-bacterial preservatives are formed from an acid (p-hydroxybenzoic acid) found in blackberries and raspberries. The media frenzy surrounding parabens originated from a 2004 study that mistakenly linked parabens to breast cancer. However, the scientists later declared that the parabens could have been from external sources like makeup, shampoo and hairspray. This rendered the study inaccurate by multiple organisations, including the EU Scientific Committee for Consumer Safety, the U.S. Food and Drug Administration and the American Cancer Society, who declared parabens to be safe to use in beauty products. A follow-up study conducted in 2012 also revealed that parabens were found in women who’ve never used products containing parabens. Nonetheless, to cope with the increasing consumer demand of paraben-free products, the industry is using a worse alternative; preservatives containing Methylisothiazoline (MI). MI is used in industrial paints and glues and has been linked to numerous cases of allergic contact sensitization. Phthalates (pronounced thal-ates) are another urban legend that many consumers avoid. Essentially, they are man-made chemicals extracted from petroleum, and are usually added to hold scents and/or colours in cosmetic products such as nail polish and fragrances. Though there has been some debate about its hormone disrupting capabilities, studies and scientists beg to differ. The Centers for Disease Control and Prevention and American Council on Science and Health have deemed phthalates to be a safe ingredient. Phthalates’ bad reputation may have been a result of the lack of proper scientific examination and pressure of media hype. Before you go about wondering if the alcohol in your moisturiser is the same one you drank at Zouk last night, know that alcohol in cosmetic products are different from those we consume. Typically, alcohols in cosmetics can be categorised into 3 types: simple alcohols, fatty alcohols and aromatic alcohols. Simple alcohols like specially denatured (SD) alcohols and denatured alcohols are typically used for its preservative and antibacterial properties. When used in large amounts, they may dry out the skin. However, many products add other moisturising ingredients to counter the drying effect of these alcohols. Common fatty alcohols like cetyl and cetearyl alcohol can be from natural sources such as coconut, palm oil and petroleum, or man-made in the laboratory. Due to their fatty acids that hydrate the skin, they tend to be used as ointments or thickeners in products. Aromatic alcohols add fragrance, help to preserve products and dissolve ingredients to produce a smoother solution. A common example is benzyl alcohol, a component found in many fruits, plants and essential oils like jasmine and ylang-ylang. Unfortunately, many manufacturers make the synthetic version of benzyl alcohol by mixing benzyl chloride with sodium hydroxide. This man-made mixture, unlike its wholesome counterpart, is known to be a skin and eye irritant. Contrary to popular belief, not all alcohols used in skincare are bad. Ultimately, it depends on the amount of alcohol used and its accompanying ingredients. Mineral oil and petrolatum, derivatives of petroleum, are also controversial ingredients in the beauty industry. But you need to consider the grade of ingredient, which vary in quality and purity level. Research has shown that cosmetic grade mineral oil and petrolatum are one of the safest, most moisturising ingredients in the market. After its purification process, it’s a gentle and soothing ingredient that’s safe for the skin. These ingredients are commonly used in beauty products as they protect the skin from irritants, bacteria and excessive water loss. However, factors such as the brand’s reputation and the manufacturer’s country should be considered. Shady brands may stoop to using low grade mineral oils, while ingredient manufacturers in corrupt countries may engage in bribery to gain the cosmetic grade certification. This affects the actual grade of mineral oils and petrolatum in the product and may adversely affect the skin (i.e. cause the product to clog pores). From baby powders to cosmetics, the term ‘Hypoallergenic’ is one of the most misleading labels. No, it doesn’t mean it will not cause allergies. According to the Health Sciences Authority (HSA), ‘hypoallergenic’ is used to indicate that the product will be less likely to cause allergic reactions. 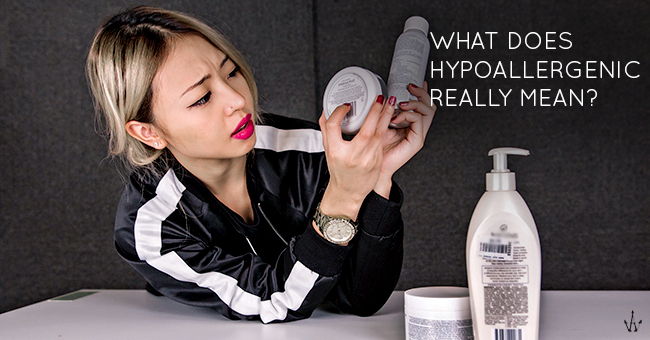 There is little scientific proof needed for a product to be certified hypoallergenic. Even in law-abiding Singapore, the cosmetic industry can still get away with this controversial misconception. Likewise, having a product that is “natural” may simply refer to an extracted or purified ingredient – it doesn’t have to be totally organic. Additionally, cosmetics are considered to be of lower risk than other health products. Hence, brands don’t require assessment or approval by HSA to be released in the market. Due to its non-biodegradable properties, there has been some debate about silicone’s effects on the environment. However, there hasn’t been actual scientific research that demonstrates the ingredient’s detrimental effects on humans. Common forms of silicone in cosmetics like dimethicone, cyclomethicone and cyclopentasiloxane have been declared safe for topical application. Besides enabling optimal production of collagen that improves skin strength and elasticity, silicones also blur flaws, increase the effectiveness of sunscreen and provide emollience. Allergic sensitivities are difficult to gauge as individuals react differently to ingredients. With research and innovation abound, it’s virtually impossible to know what products will work on your skin until you use it. When in doubt, individuals should conduct a patch test to learn more about their allergic sensitivities.